Fallowfield, H.J., Young, P., Cromar, N., Taylor, M. and Buchanan, N. 2019. Validation of high rate algal ponds as an efficient wastewater treatment option to improve public health in rural communities. In: J.B. Rose and B. Jiménez-Cisneros, (eds) Global Water Pathogen Project. http://www.waterpathogens.org (S. Petterson and G. Medema (eds) Part 5 Case Studies) http://www.waterpathogens.org/book/validation-of-high-rate-algal-ponds-as-an-efficient-wastewater-treatment-option-to-improve-health Michigan State University, E. Lansing, MI, UNESCO. 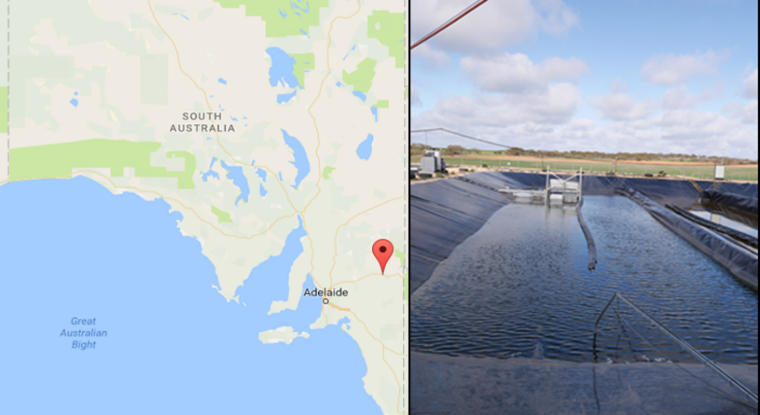 The objective of this case study is to determine if wastewater from a South Australian rural community treated using a high rate algal pond (HRAP) can safely be used for irrigation of non-food crops. The study was conducted at Kingston on Murray, a town on the southern bank of the Murray River within the District Council of Loxton Waikerie in South Australia, approximately 220 km north of the state capital Adelaide (Figure 1). The town is situated within a citrus and wine grape growing area. The community has a population of approximately 250-300 residents and comprises residential properties, a school and a backpackers hostel accommodating seasonal fruit pickers. Figure 1. (left) Map of South Australia, with Kingston on Murray marked by a pin approximately 220 km North-East of the capital city Adelaide; (right) the HRAP located at Kingston on Murray, with the paddlewheel visible at the far end of the pond (photo by H. Fallowfield). The HRAP is incorporated into a Community Wastewater Management Scheme (CWMS). Flushed toilets discharge into on-site septic tanks, from which the effluent is reticulated to a reception pit and pumped to the community managed HRAP. The HRAP comprises a HDPE lined single pass raceway, capable of operation at depths between 0.3-0.5 m and a hydraulic retention time (HRT) of 10d. A paddlewheel gently circulates the wastewater. Treated wastewater is discharged to a HDPE lined storage pond prior to disposal via woodlot irrigation. Treatment: 10d HRT for > 3-log removal of E. coli and 2-log removal of viral particles. Where helminths are conisdered a hazard HRAPs should be operated at an HRT of 10d, with 15d additional storage time. Continuous inlet flows are preferable to prevent shock loading ; ideally not more than 4% of the pond volume should be introduced over a period shorter than 4% of the HRT. Restrictive measures: Preferably, effluent should be discharged via sub-surface irrigation. When using spray irrigation suitable buffer zones should be established, the irrigation area should be fenced and the public excluded.